© Absolute Misdemeanor™®: BR1M : For The Better Or Worse? BR1M : For The Better Or Worse? 1Malaysia People’s Aid (BR1M) programme was first devised by Prime Minister Datuk Seri Najib Razak in 2012 as part of the Government’s effort to ease the burden of the lower income group in Malaysia. This programme was devised to help the lower income group cushion the high cost of living in Malaysia. BR1M is also part of the Government’s Economic Transformation Programme (ETP) to turn Malaysia into a high income nation. It was not surprising, though disappointing to hear that BR1M will be continued in Budget 2016, even with 95% of respondents we polled who received BR1M said that the amount is not enough to cover the rising cost of living. So, why does the Government continue to give handouts to the low income group? Let’s start with why it is actually a good idea. With the rising cost of living, Malaysians are feeling the pinch as their disposable income shrink smaller. With specific handouts like BR1M which reach the target group more than the bulk subsidy which also benefit the rich and non-citizens, it effectively increases the lower income group’s disposable income. Under BR1M, the needy recipients can make use of the money for essentials such as food, infant formula milk, rent, utility bills, and clothing. This can indirectly help uplift the domestic economy such as the farmers’ markets, and retail shops. It gives families and individuals’ breathing space and increased standard of living. The higher cost of living is causing Malaysian consumers to tighten their belts. This is hurting companies’ earnings as one of the economic growth engines — consumer spending — may be sputtering out soon. The Malaysian Consumer Sentiments Index has been on the decline since 2009 with the index at a six-year low of 71.7 points in the second quarter (2Q15). In 1Q15, the index stood at 72.6 points. With BR1M extending the disposable income of the lower income Malaysians, small and medium enterprises (SMEs) will benefit through higher domestic consumption. The higher amount of BR1M payments should stimulate more sales and services. As majority of the SMEs are in the service industry, increasing domestic consumption is a key step to fuel the economy. When the economy is low, so is consumption sentiment. The higher amount of BR1M payment would boost domestic consumption. BRIM handouts are aimed at significantly increasing spending in the domestic market. Most people are looking at BR1M as merely a handout, but it should be viewed together with other Government initiatives to assist Malaysians. These include existing subsidies for consumer goods, price controls over essential food items, vouchers for school-going children, Government subsidised medical treatment in public hospitals and Klinik 1Malaysia, free primary and secondary education, affordable homes under PR1MA, and financial assistance to the elderly and handicapped. As a principle of economics, targeted subsidies make sense. They are given to those who need them the most. Targeted subsidy is more beneficial to the neediest of the society because general subsidies are open to abuse. For example, the previous petrol subsidy benefited everyone in the country, even the rich, and the foreigners. Consider this: A company with a fleet of cars and factories uses up more resources and subsidies than the average Malaysian is able to. The affluent with at least two to three cars use more subsidies than the poor because they consume more petrol, electricity, and food. BR1M recognises the need to respect a free market economy which promotes competitiveness and innovation, while protecting the most vulnerable from exploitation and unfettered opportunism. It enables the government to prioritise welfare concerns while respecting companies and corporations profit motives. Dependence on subsidies is not sustainable. In 2011, RM32.8 billion was spent on subsidies. In 2012 it went up to RM33.2 billion. Increasing subsidies may maintain prices, but it eats into funding for other more important efforts such as education, healthcare and public amenities. This in turn can impact Malaysia’s long-term growth negatively, that affects our ability to lower prices or increase wages. In short, blanket subsidy is a vicious cycle that leads to nowhere. When BR1M was introduced in 2012, long before the current major concerns with price hikes arose, the Government showed good foresight and had introduced a prudent plan to address the increasing subsidy bill and the effects of inflation. In respect of the increasing subsidy bill, the Government spent RM2.9 billion on BRIM in 2013, but it saved RM1.1 billion from subsidy cuts. In 2014, the Government saved RM3.3 billion due to subsidy cuts whereas the spending for BR1M was only RM4.5 billion. So the deficit is now reduced to RM1.2 billion, but with a much larger chunk of the economic wealth going to those who need it the most. In the long run, the amount saved through subsidy rationalisation will be higher than the amount spent on BR1M. Nevertheless, BR1M allows the Government to assist those who will be hit hardest by inflation. 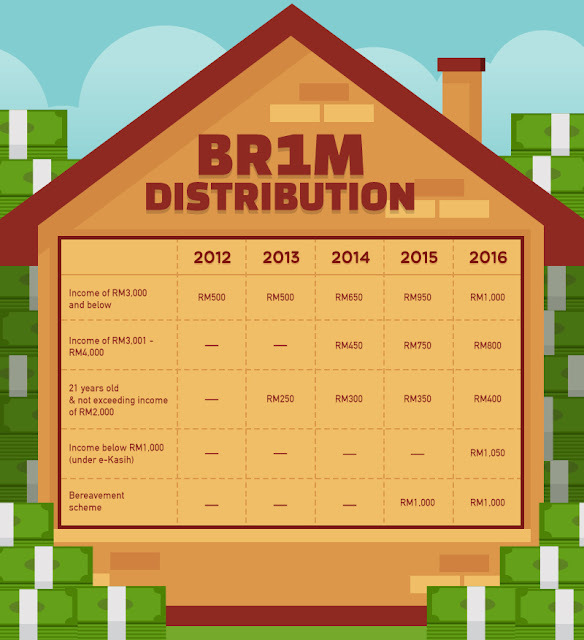 BR1M, being a targeted subsidy, allows inflation to be managed appropriately without stifling free market forces. However, there are always two sides to a coin. There are pros to BR1M, but when mismanaged, it can lead to a long-term disaster that may take a long time to fix. Here are some valid reasons brought up by #teamnoBR1M. Rental costs and food can vary widely between urban and rural areas. These are the top two largest components of a household’s monthly expenditure, according to the Department of Statistics Malaysia. According to the Household Expenditure Survey 2009-2010 (HES 2010), the average monthly expenditure was RM2,465 in urban areas and RM1,599 in rural areas. Those 2010 figures may be a far cry from the actual living costs today, after the Government cut fuel subsidies, implemented GST and hiked the electricity rates for businesses (to name a few). In short, the average urban household monthly expenditure is 1.5 times more than the average rural household. A higher quantum of cash aid for urban areas should be considered. The threshold could then be calculated by using the consumer price index (CPI) for urban and rural areas, as well as by states. According to the mean income calculation, the so-called ”average” Malaysian household earns RM5,000 a month. The median calculation, on the other hand, is RM3,600, meaning half of the country, or roughly seven million households earn less than that a month. If we split it up to urban and rural, there is quite a big gap between the two. For urban households the median income is RM4,238, and for rural households, it is RM2,372, according to the 2012 Household Income Survey. According to the same survey, the make an average RM1,847 a month. The make an average of RM4,573 a month. So even with the government’s own cut-off points, almost 50% (all of the bottom 40% and a third of the middle) of Malaysians qualify for some form of BR1M. In other words, in the current Malaysian economy, half of the country’s households do not earn enough to make ends meet. 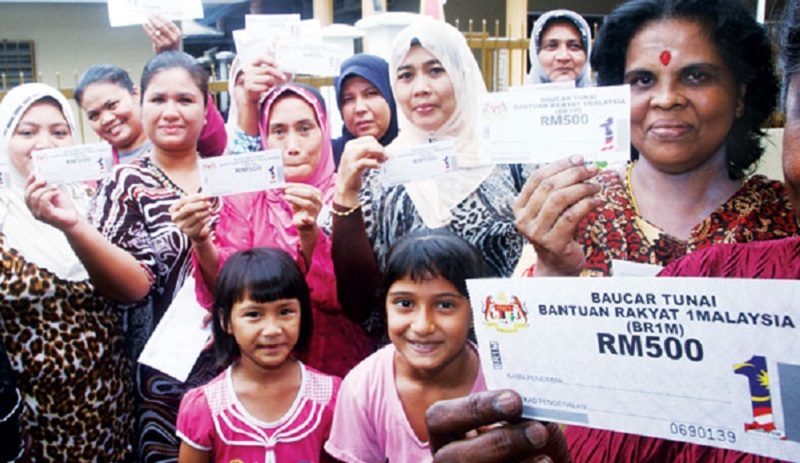 BR1M is one of the initiatives necessary for Malaysians to address poverty. However, BR1M should evolve in the future to avoid abuse or to avoid incentivising laziness or complacency. What Malaysians need more than money is learning how to manage their money well. Good money management can help one deal with debts and also accumulate wealth. This is better than any handout. Approximately 22,663 Malaysians under the age of 35 were declared bankrupt from 2011 till to-date. Failure to manage their financial resources responsibly was the major reason behind the bankruptcies for the young age group. With that statistic, it is very telling that giving the B40 money is just half of the battle. Knowing what to do with that money is the bigger issue at hand. Should they wantonly spend the money in the next smartphone or a vacation? Or should they only spend on necessities and put away a part of it for rainy days? They need to be armed with this kind of knowledge if the Government were to, one day, cease cash handouts. Learning what to do with credit, how putting money in fixed deposit accounts can help them, and also other investment options that can help them optimise whatever cash they get, will teach them how to survive without BR1M. Financial management services and seminars should be given to Malaysians at large to improve their financial literacy. To ensure the BR1M money is not wasted frivolously, it should be released periodically over the period of one year. BR1M makes it so much easier to fall back on the Government financially. Giving money freely puts a damper on competitiveness in the market place, which will see a slump in productivity and as a result, the economy will remain stagnant. Increasing income should be done by creating opportunities for work or business. High income should come from increases in productivity through better education and training. When we promote industries with greater added value, the income levels of the employees would increase in tandem. To be a developed nation, we have to be at par with other developed countries in terms of education, technological and industrial know-hows, research and development, industrialisation, infrastructure, and yes, income. We need to be more productive. It is imperative therefore to prioritise spending on education and training to build up engineering and industrial capacities, increase productivity and competition, first-class infrastructure and to train a new generation of researchers, inventors and developers. Handouts are contrary to all of this. Do we need BR1M for years to come? There are times for cash handouts and there are times when a “no” would get the desired results. Though there are many good and valid reasons to give out BR1M, but there are also better alternatives to just cash handouts. BR1M should only be a temporary measure to aid the poor, to give them a leg’s up the financial ladder, but it is not a long-term plan. This is clear as we know that BR1M even with its marginal increase will not be enough to cover the expenses of the target group. It’s not sustainable in the long-term as increasing it in a meaningful way would cost too much. We need a comprehensive social safety net for the poor, instead of just giving out cash. Even among the B40 there are different levels of needs. To eradicate poverty and help the marginalised amidst the rising cost of living, the Government needs to identify the needs for the group especially the pensioners, and the disabled. Find out what are their housing needs; what about their children; and will upskilling for better jobs be effective. Even aid comes in many forms such as food stamps or special rate rentals, which is why financial help should not be a one-size-fits-all strategy. Looking at the bigger picture and for long-term growth, more money should be poured into (skills) training, poverty eradication programmes, public transportation infrastructure, affordable housing, job placement and reduction of household debts. Many other things still need to be done, and BR1M may just be the first of many steps in the Government’s bid to bring the population to the high-income level. These are the challenges to any Government effort and it should be proactive in addressing any problems that may arise. But for now, BR1M is the immediate action to help certain quarters of the society in coping with the rising cost. With better planning, let’s hope that BR1M will not be needed in the near future.